Take care of the trailer now and it will return the favor in the spring. Like Rodney Dangerfield, boat trailers get no respect. Most times during the season — if they are lucky — trailers get rinsed off, the bearing buddy gets a shot of grease now and then, and the tires are checked for air. This year, before putting your boat into hibernation, give the trailer some love. The best way to tackle this project is to drop the boat in the water and dock it. That way you can access areas of the trailer that are otherwise inaccessible with a boat sitting on it. First, check the bunks. If they have carpet over wood, make sure the boat hasn’t rubbed any bare spots, which can scratch a boat’s gelcoat. Replace any worn spots. If the trailer has rollers, inspect them and replace any that need it. Consider using non-marring vinyl rollers instead of rubber ones that can leave black marks on the hull. Trailers are either aluminum, galvanized steel or painted steel, and all can experience problems due to the use of dissimilar metals, which causes galvanic corrosion, especially when aluminum and stainless steel are in close proximity. Often, a washer is the culprit where bolts are used. Go over the entire trailer and look for signs of corrosion. A wire brush and metal cleaner will remove any corrosion, but it will return unless something is done to actively inhibit galvanic corrosion. If the bolts, nuts and washers are badly corroded, replace them with like metals and then coat them with Ultra Tef-Gel ($24.99 for a two-pound tub), which is a product developed in the aerospace industry. Aluminum frames don’t rust, but they can get badly oxidized. Many aluminum cleaners include acid, which requires user protection; a steel wool pad only costs a few dollars and does a really good job. Make sure the trailer doesn’t have a clear coat, though, or steel wool will remove it. For painted trailers, inspect every square inch for rust, especially underneath, where water tends to linger. Sand any rusted areas or use a wire brush, then paint with a rust-inhibiting paint such as Rust-Oleum. Wax the paint with boat wax, to leave a protective barrier. Now check the electrical wiring, especially where there are connections, which are prone to corroding. 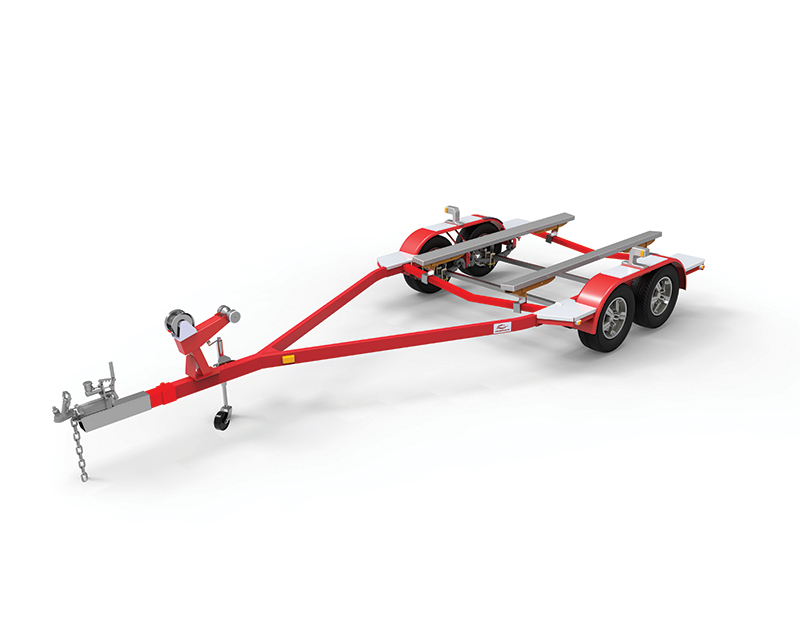 First, make sure the trailer is disconnected from its tow vehicle, to avoid shocking surprises. Crimped connections that exhibit any sign of corrosion should be sprayed with CRC Marine QD Electronic Cleaner ($10) and brushed if needed. Disconnect bayonet connections, apply dielectric grease and then reconnect. Replace any connection that’s badly corroded and replace wiring that’s nicked, or at the very least tape it, but know this creates a weak link in the electrical chain. It’s a good idea to remove the wheels at least once a year to see what’s going on behind the rubber curtain. Loosen the lug nuts, jack up the trailer and remove the tires. Don’t use an air hose to quickly clean the area like they do at the brake repair shop. While asbestos hasn’t been used in brake pads for years, breathing in any sort of dusty particulate is bad. Instead, use a wet a rag to clean them, and inspect the area thoroughly. Some of the components — the exterior of a drum brake, and leaf and coil springs — might have surface rust, but that’s usually not really important. To get rid of it, spray on Rust-Oleum’s Rust Reformer ($5), which bonds with rust and converts it from red iron oxide (rust) to black iron oxide or magnetite, a fl at-black paintable surface that won’t rust. For areas that are visible, rust removal is the way to go, and a product such as Loctite’s Naval Jelly Rust Dissolver works well. To go low tech, use vinegar and a wire brush. Be on the alert for things such as corroded hydraulic lines that could eventually fail. Inspect the inside of the wheel itself, which, unlike the outside, seldom gets any love. Now, load the boat back on the trailer. Few trailer tires, other than those owned by tournament pros, wear out because of excessive mileage. Dry rot often kills them long before that. Products such as Armor All Tire Foam will keep them protected from the elements. Now the big question: Do I jack up the trailer or not? Tire manufacturers Michelin and Goodyear agree that it’s better to jack trailers up during extended storage, to prevent flat-spotting and sidewall damage. For a trailer with leaf-spring suspension, wrap a heavy-duty cargo strap with a tensioner around the axle and frame, to prevent the axle and wheels from sagging. Then use a floor jack a few feet behind and then in front of the axle to raise the trailer before supporting the frame with blocks or a lift stand. Avoid propping it up at the extreme ends of the frame, to avoid bending it. You may have to use wood under the stand, too, if the trailer is on soft ground rather than pavement. Make sure to elevate the front slightly, so water drains. Jacking up the trailer offers an extra level of security and makes thieves think twice, especially if the tires are removed and stored in the garage. Lubricate every moving part. Parts that are left unprotected tend to want to stay months. Be sure to grease the wheel bearings but don’t overdo it. Use CRC White Lithium Grease ($6) in a spray can, which does a good job lubricating parts such as jack handles, hitch coupler hinges and roller axles. Remove the car’s hitch ball for the winter, or cover it with something that will keep it from getting too rusty. Check the jack stand and column that supports the winch, and double check the winch cable or strap for signs of wear. Last, make sure the rig is well secured. Thieves target stored boats, because they know owners aren’t keeping watch as closely as when they are using it every week. In our last issue, we gave detailed instruction how to do this, but at least use a wheel lock (if you are not jacking it up), a coupler lock and an outboard lock. Great article on “winterizing” one’s boat trailer and the suggested sprays, ointments & gels to do it with + “elbow grease” but there was also a reference made somewhere about a prior recent article which referenced prepping one’s boat (winterizing) for winter so could you send that article to me or direct me to it please?